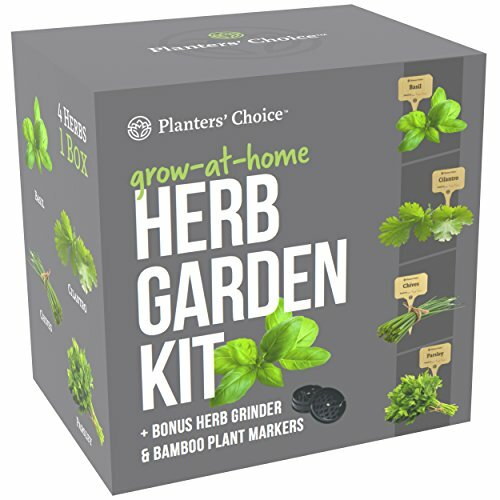  EVERYTHING YOU NEED TO EASILY GROW 4 CULINARY HERBS AT HOME, IN ONE SLEEK BOX: 4 biodegradable growing pots, 4 moisture-proof organic seed packets, 4 soil discs that expand to 7 times their size when watered, 4 beautiful bamboo plant markers, 1 herb grinder and a beautiful, comprehensive instruction booklet. Grow the following 4 tasty herbs: Basil, Cilantro, Chives and Parsley.  #1 GROWTH PERFORMANCE: The Planters' Choice kit has the best growing success rate on the market. We package the seeds in our seed-safe Mylar pouches to ensure proper germination. We only source our 100% organic NON-GMO seeds from the best local farms and the kit is proudly assembled in the USA.  A UNIQUE GIFT FOR THAT UNIQUE SOMEONE: For your best friend or loved one, this beautifully packaged indoor herb garden kit is the perfect gift. See the excitement in their eyes as they receive this elegant gift box. For mom, dad, him or her, this is the perfect gift to give on birthdays, anniversaries, holidays or any other occasion. Ideal for beginners, masters and children alike.  NO GREEN THUMB NEEDED: Our instruction booklet is the most comprehensive, detailed and beautifully-designed on the market so that you can follow along on the journey of each seed, its history, and the best way to plant it to ensure it germinates. This book will teach the beginner and entertain the master.  100% SATISFACTION GUARANTEED: Love it, or your money back! We have extended all our effort in this kit to make it the best in class and we are positive that you will love it. If you struggle with any aspect of the process, don't hesitate to contact us. We promise to help you out until you receive the results that you want. Nevertheless, if you are not satisfied with the kit we'll refund you 100% of the money, no questions asked.